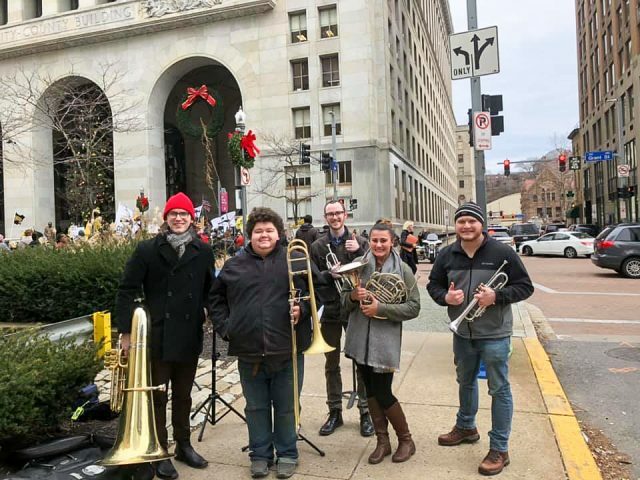 Among hundreds of pro-gun protesters rallying in Pittsburgh on Jan. 7, there was a brass quartet of Youngstown State University students and alumni playing traditional Hebrew music to peacefully counter protest the pro-gun rally to honor the Tree of Life Synagogue victims. Open carry advocates hosted a rally in Pittsburgh in response to recent Pittsburgh City Council legislation passed that would ban assault style weapons. This legislation was passed in response to the Tree of Life Synagogue shooting in Squirrel Hill on Oct. 27, 2018. Rally attendees, many legally armed in protest, said the legislation was unlawful and outside of their constitutional rights. Herbie Hunkele, a senior musical performance major, was encouraged to counterprotest the rally after posts on social media claiming Kaitlin Bennett, known as “Kent State Gun Girl” was going to be there. Bennett, a former Kent State University student and pro-gun activist, rose to fame on social media after posting photos with an AR-10 rifle during her May 2018 graduation ceremony. The quintet was made up of Hunkele, as well as Ross Hill, a senior music education major; Sarah Schwenke, a junior music performance major; and two YSU alumnus Bo Violette and Travis Beatty. The group had never played the music before the rally and only rehearsed the songs the day before. Although the quintet was in opposition of the rally, they didn’t go to Pittsburgh to protest gun laws in general. “My issue wasn’t with the open carry rally. I understand Pennsylvania is an open carry state. It was the disrespect for me and the fact that Bill Peduto [mayor of Pittsburgh] is trying to represent the people that elected him,” Hunkele said. Schwenke said when Hunkele first approached her with the idea of counterprotesting, she was all in. When the quintet first arrived to the rally, they looked for other counterprotesters, but without luck. They started playing their music, which attracted others. “By playing the music, we gathered people who were there for a similar cause who didn’t agree with what was happening, and it was cool to get to share our experiences and thoughts with them,” she said. Eventually a group of around 12 people circled around the quintet. “At first it only started with the five of us then the rest were people who inevitably congregated around us,” Violette said. Many protestors argued that if the synagogue victims had been armed, perhaps there would’ve been a different outcome on that October morning. “That’s a crazy thought to try to stop the guy with guns with more guns. Let’s stop a fire with more fire,” Violette said. The group of Penguins got mixed reactions from bystanders, although no one tried to stop them from playing. “One woman who stood with us said she was friends with a few of the victims and she thanked us and sang with us,” Hunkele said. For a moment, regardless of political beliefs or open carry views, everyone took a moment to honor the victims in their own way. The quintet has received some backlash online after Hunkele’s Facebook post about the rally was shared more than 170 times and news outlets like the Pittsburgh Post Gazette published stories about the groups peaceful protest. When dealing with the negative feedback, Hunkele said there was more love than hate from online commenters. “That’s what made [the backlash] tolerable. All of the really hateful comments were indirect, no one contacted me personally,” he said. All in all, Hunkele said he thinks there is a lot to be said about creating a peaceful dialogue in this political climate.